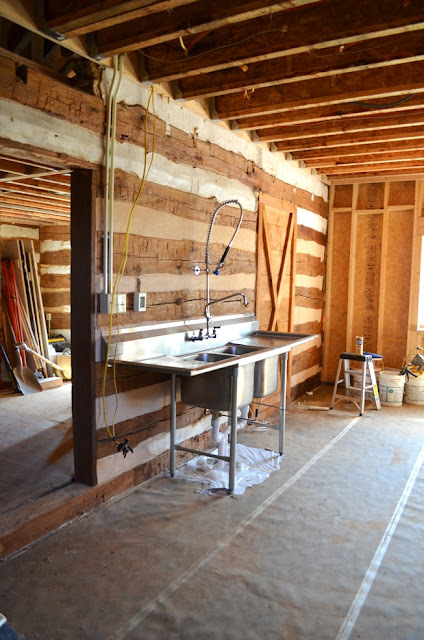 Cabin Fervor: Kitchen Update: Sink! Something productive happened this week! The kitchen sink, which we bought for $279 at a salvage store in Baltimore, is officially installed (and functioning)! I am in love with this thing, and even little Johnnie is excited to take a bath in it. It's going to look even sexier once we give it a good cleaning. We got the sweet curvy faucet/dishwasher's wand from the WEBstaurantStore. We also splurged a little and bought lever-operated waste valves for the drains. Instead of sticking your hand down in hot or dirty water to release the drain, you simply turn one of the black handles (see photo below) under the basins. Who doesn't want to escape the dreadful experience of touching all the soggy bits of food at the bottom of the sink? I know having a 7-foot industrial sink in their home is not everyone's taste, but clearly we have the space for it. This kitchen is really, luxuriously big! And I think the logs, wood plank walls and brick fireplace will add warmth to balance it all out. There is still a lot to do, but it's not that much compared to where we started. S and his dad have been chipping away at a few other projects this week as well, so I have more updates to share soon. Yay! Looks awesome! I especially like the contrast of the metal against the uber-rustic log wall. Yay for progress! The sink is amazing. And who couldn't use that big of a sink? How awesome! It's going to look amazing! When you put in the dishwasher, would it just go right next to the sink, under the counter parts? Just curious. Thanks ladies! And yes, Kim -- that's exactly where it will go, under the right-hand drainboard. 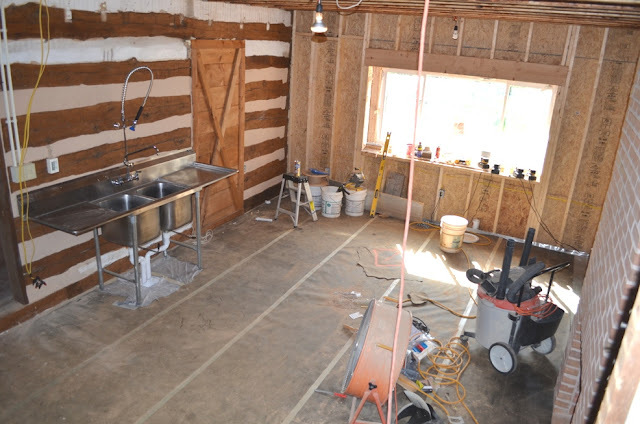 We already have the plumbing in place for it and everything. A very nice look! The dish spray thing is way-cool. The sinks are big enough for you all to get into during a tornado, Bonus! I see those light switches as well. What's happening with the drains? How will they terminate? 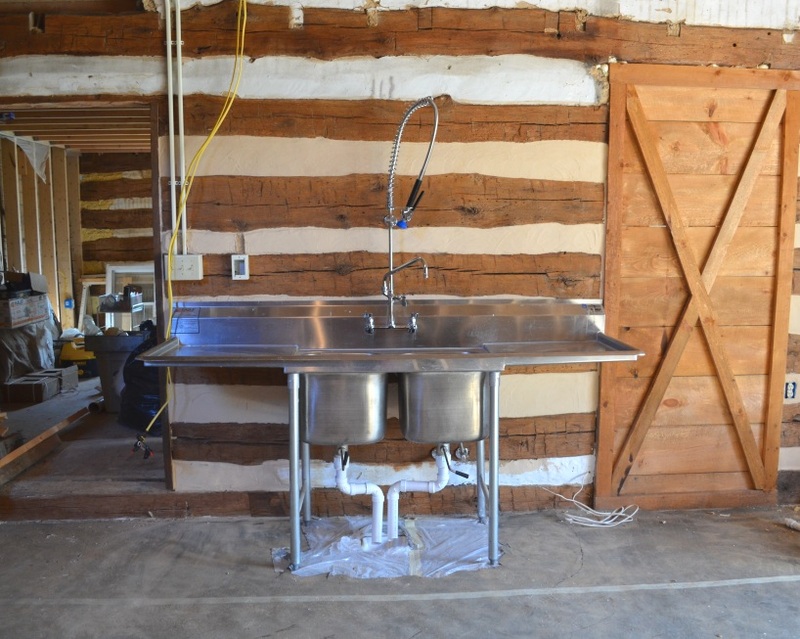 That is exactly the type of sink I am thinking about for my laundry room. We figure it will be perfect for washing small dogs as well. I'm glad to know you can find them at a reasonable price. Yay! 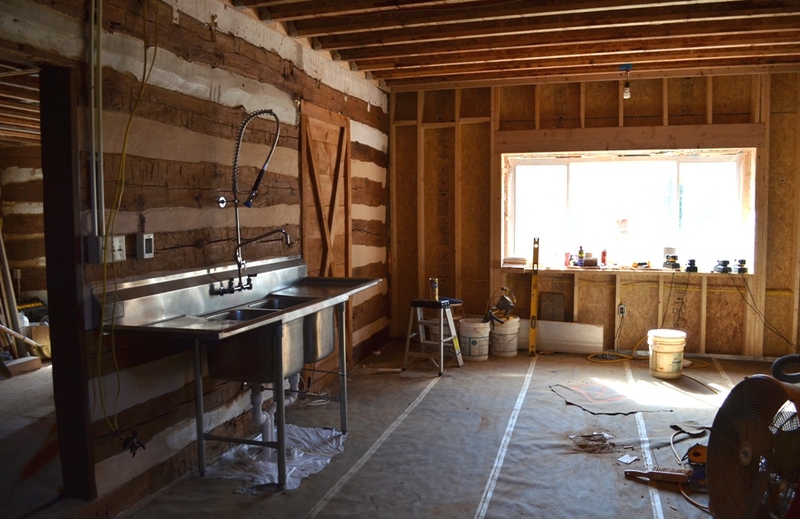 I've been waiting for some kitchen progress pictures...I know I know you've been busy with other more important things. : ) Looks amazing against the rustic wall. What a charming space it's going to be!